BAGCLUES K-STAR 9*12 carry bag is made up of 100% Virgin PP non-woven fabric using German Technology, which is entirely different from regular non-woven fabric. Our non-woven bags are manufactured in our plant in New Delhi and are made with German technology. Our products are 100% quality assured, safe and reliable, unmatched variety, highly durable and Eco-friendly. We “BagClues Exim Private Limited” are involved as the manufacturer, supplier and exporter of premium quality lower gsm (20 GSM) Non Woven Bags under BAGCLUES K-STAR and BAGCLUES SUPER-K brand. 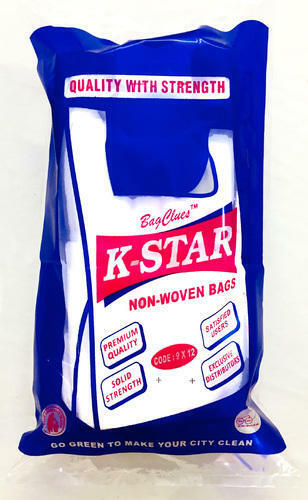 Our 20 Gsm Bagclues K-Star and Bagclues Super-K Non Woven Bags are manufactured by using the best quality Non Woven Fabrics with our own manufacturing. Our 20 Gsm Bagclues K-Star and Bagclues Super-K Non Woven Bags are manufactured by using advanced processing equipments and machinery which focus on new application developments. These 20 GSM bags can be used for versatile purposes with solid strength of developing innovative & customised solutions for our customers.